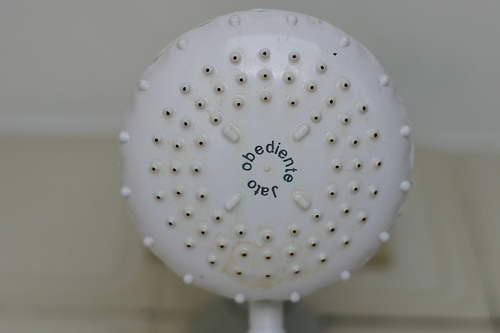 Every so often your shower head gets to gunky that you just can’t stand it, but at the same time, you don’t really want to just dip it in a big bowl of chemicals and then pour them down the drain, do you? Luckily, there’s a better solution! Find a pot that will hold the showerhead and fill it up with vinegar. Stick the showerhead in so that it’s completely submerged (but it can’t be touching the bottom, so you might need to use some string or a strainer or something to hold it suspended if it won’t float). Put the pot over some heat and let it heat up, but not all the way to boiling, you don’t want to melt anything. Let it simmer for a few minutes until the deposits break loose, then take the showerhead out and rinse it and scrub remaining mineral deposits off in the sink. Reinstall the showerhead and enjoy. [GoogleAdGoesHere] You will end up using a bit of vinegar, but it’s the lesser of two evils, to be sure. Has anyone tried this before? Do you have your own home made cleaning recipe like this one? Let us know in the comments! That seems like it’ll leave you smelling like vinegar for weeks after using it….